Ring Sizing Explained - What do You Pay More For and Why? Ring Sizing Explained – What do You Pay More For and Why? It’s Your Dream Ring, But it Doesn’t Fit! Silly question, what woman reading this doesn’t and chances are you’ve had a little ring sizing experience. Unlike shoes and tires, rings in jewelry stores typically don’t come in assorted sizes—at least not rings in Santa Barbara. If the one-of-a-kind ring in the display case you’ve always wanted is a size 5 and you’re a size 7…you’re going to have to size that ring. No two ways about it. Let’s start with the size 5, dream ring you just bought. You’re a size 7 and the ring will have to be sized up. Let’s talk about #1, Stretching. This is going to be a short talk. I don’t recommend this technique! 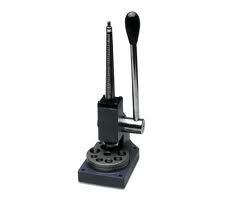 It makes the shank thinner and weakens the overall integrity of your ring. You know how a rubber band looks when you pull it apart? Now imagine that being done to your ring. Let’s talk about #2, adding a bridge of gold. This is done by cutting the bottom of the shank,when your ring is brought up to the proper temperature slowly. Then we gently pull the two sides apart. We then custom build a bridge of new gold, the width and depth of your ring in the size needed to enlarge it. We solder or laser weld the newly made piece into the opening we’ve created in your ring to make it larger. The key is to preserve the thickness at the base of the ring where it is so needed. The gradient way we bring your ring up to the proper heat level to work the gold, platinum or silver is key in keeping the molecular bonds strong in your ring. Sizing a ring down is similar. The proper length of gold is cut from the bottom of the shank and the two sides are joined together and soldered closed. I’m often asked what we do with the little piece of gold that is left over when we make a ring smaller. 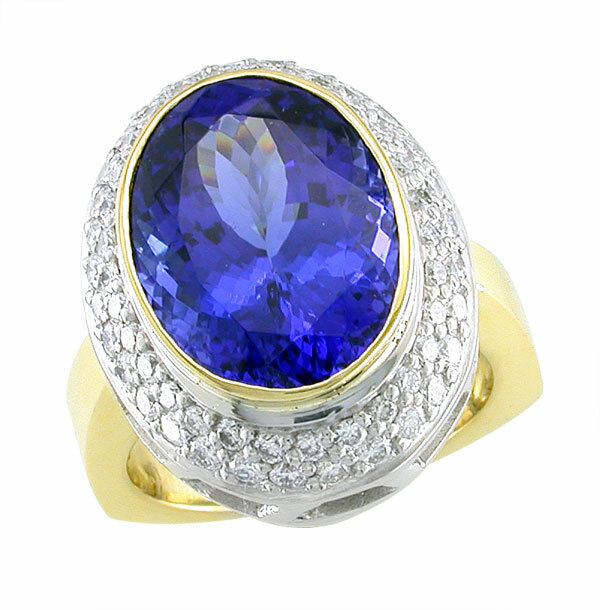 To preserve the beauty and integrity of your ring, we are careful of the ring. The little piece that we remove, we’re not so careful of. It ends up in a small sizing a little misshapen bit of gold or whatever metal we’re working on. We do a quick weighing and credit you for the gold. We recycle the gold. 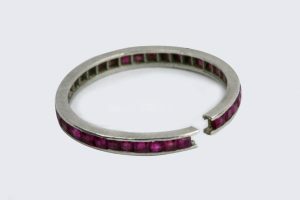 If we remove a piece three sizes or more from a wide ring we return the piece to you. 3. 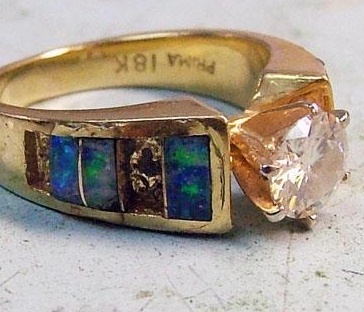 Your Ring Has Inlaid Stones, which will likely break due to heat or pressure. Some Might Say, “That Ring is Done.” Not me. 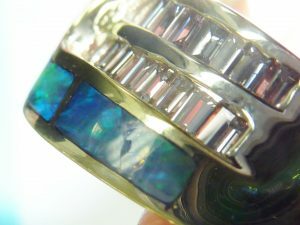 If you have an older or worn ring and the jeweler says, “Just get a new one, this one’s just finished,” you may want to look for another jeweler. If your ring has special meaning that you want to honor, you should have a jeweler who respects that and has the skill to add to the long life of your cherished ring. Each of the above challenges comes with ways to work around them, like low heat laser ring sizing, gemstone setting skills and hand engraving skills. There’s no shame in a jeweler not having all those skills, just don’t give your ring over to a jeweler who doesn’t have the know how to re-size your ring and return it in great condition. 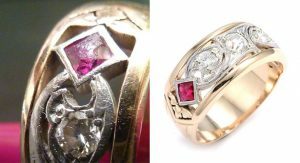 Whether the ring is being sized up and the shank is pulled apart or the ring is being sized down and the two sides of the shank are joined together, the gemstone settings at the top and on the sides of the ring can become compromised. This is especially true for channel set and inlay set gems. 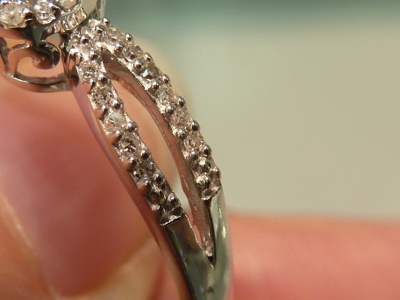 The internal angles of the channel can change and shift slightly when the shank is modified, thus upsetting its ability to hold its gems securely in place. This means that you should always examine all the gems and settings of a ring that’s been sized. Try moving the stones with your fingernail or a toothpick. Obviously, they shouldn’t move. If any of them do, send the ring back for adjustments right away. 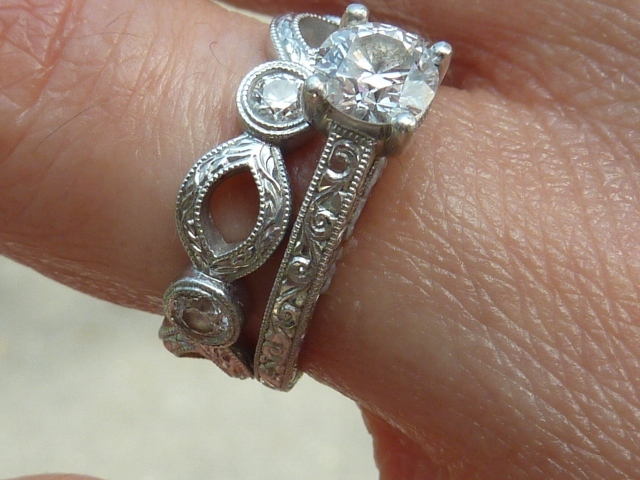 Make sure the bottom part of your ring is nice and thick, too, so it conforms to the rest of the shank. Too often, I’ve seen thin and narrow sections of shanks due to improper sizing technique. Where’s the Master Price List for Ring Sizing? I get called regularly with the question, “How much to size my wedding ring?” Personally I want to see it first. Your ring’s condition is a part of the cost of sizing. Just like when you take your car in because it’s pulling left and in a general check they find out your brake pads are just about worn out, a jeweler can see things that may need to be dealt with. You may be hoping for a simple $50.00 sizing and discover one of your prongs has broken off and now your repair bill is going to be $110.00. Happily you didn’t lose your diamond. There is no master price list for ring sizing. I actually tried to make one for internal use. It ended up being pretty useless so I just bid each ring as it comes. Get a good jeweler who loves and cares for your rings, because sizing is a fact of life. Did you know that your knuckles never stop growing? I know, weird huh? I’ve edited this in later, because I know many people who have paid twice to have their rings re-sized. Read my post on measuring for your finger size properly. It talks about what your comfortable fit feel is and if that is safe or just too loose. I also talk about the tools of sizing, because having the wrong ring sizing tool for the job can lead to a incorrect size. Read my blog about figuring out your finger size. May your rings always be the right size! PS: For more on ring sizing, check out my post on, weight gain and sizing your rings, and how laser welding sizes unfixable rings. I had not considered all these ramifications of getting a ring sized. Of course the solutions that come to mind are 1) get the right sized ring in the first place and 2) get a custom made ring as it will then be both the right size and exactly what you want. Cuz, yikes, I’d hate to have a stone fall out or my ring be compromised. Thanks for the tips, Calla! I’m sure many of us come in with the idea that sizing is an easy task and you just move some things around and viola! Thanks for breaking down the steps of measuring for a correct finger size. I would probably be hesitant to size any inlaid piece–unless it was Calla Gold Jewelry doing it! I just paid 300.00 dollars to get my wedding ring resized. It sounded expensive but I haven’t been able to wear it and it’s getting sized up. Was that over priced? I already paid it and feel extremely stupid. what is the average pricing of sizing a ring up? I have a Michael Beaudry platinum set that needs to be re-sized what should I expect to pay?..scared it may be insane. I just had a ring sized down from an size 8 to a 7. It was a bushed, white gold, flat on the inside and out. Also, was 10K gold. What I received back was polished, concave on the inside and out. Doesn’t even look the same! Clearly I am disappointed, but they said it was due to the compression method used to achieve this. What is your opinion of this, I don’t feel this is even the same ring! Thanks for the response. It wasn’t a hollow construction. And I should clarify – I meant to say “convex” as opposed to “concave”. So the inside now has a comfort fit – but it didn’t before. The ourside now isn’t flat anymore. That’s the biggest issue I have it that sizing shouldn’t change the shape. I suspect they either lost my ring or I have someone else’s!